Here you can find all info about Amnesia Haze Automatic from Royal Queen Seeds. If you are searching for information about Amnesia Haze Automatic from Royal Queen Seeds, check out our Basic Infos, Gallery, Degustation, Strain Reviews, Shop-Finder and Price Comparison, Lineage / Genealogy or User Comments for this cannabis variety here at this page and follow the links to get even more information - or list all Amnesia Haze Automatic Strains (±2) or even all Amnesia Haze Strains (47) to find a different version. If you have any personal experiences with growing or consuming this cannabis variety, please use the upload links to add them to the database! Amnesia Haze Automatic is an automatic flowering ruderalis/indica/sativa variety from Royal Queen and can be cultivated indoors and outdoors where the female, autoflowering plants need ±77 days from the seedling to the harvest. Royal Queens Amnesia Haze Automatic is/was only available as feminized seeds. The Amnesia Haze Automatic aims to solve these problems. Offering the same euphoric high and spicy, sweet taste as the original Amnesia but with a heavily reduced growth time and a much smaller height. This means she can be grown by many growers who before would not be able to grow her. Amnesia Haze Automatic from Royal Queen Seeds is available only as feminized seeds. Regular seeds are not available at the moment. In 17 seedbanks, we found 68 offers between USD 8.17 for 1 feminized seed and USD 992.54 for 100 feminized seeds. If you are looking to buy Amnesia Haze Automatic Cannabis Seeds from Royal Queen Seeds somewhere - have a look to our Amnesia Haze Automatic Price Comparison page with all current offers from all the connected seedbanks and shops - or visit one of the following tested, trustworthy and recommended seed-shops directly to check out their current Amnesia Haze Automatic offers: Royal Queen Seeds, Indras Planet GmbH, Samenwahl.com, Alchimia Grow Shop, Cheeba Beans, Cannapot Hanfshop, Seeds24.at, Zamnesia, Discreet Seeds, Original Seeds Store, Herbies Head Shop, PEV Seeds Bank, Amsterdam Seed Center, canna-seed.com, Oaseeds, Canna-Seed Seed Shop and Linda Seeds | Linda Semilla. We've collected strain info from 4 growers for Amnesia Haze Automatic, check out the reviews about the indoor and outdoor grow here. Amnesia Haze Automatic gets 6.04 of 10 possible Points in the average! How is Amnesia Haze Automatic growing outdoors? How is Amnesia Haze Automatic growing indoors? 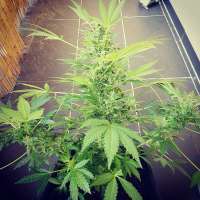 The seedfinder users tested Amnesia Haze Automatic and uploaded information about the aroma and effects of Royal Queens Amnesia Haze Automatic. Here a short overview, click to the charts or links to get an exact description and find similar cannabis varieties! Here you see the latest Amnesia Haze Automatic photos, uploaded from our users! Altogether we've collected 11 pictures from Royal Queens Amnesia Haze Automatic, check out our Amnesia Haze Automatic gallery to view them all. 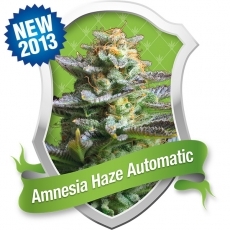 Altogether we've collected 3 user comments about Royal Queens Amnesia Haze Automatic. Here you find the 2 english user comments, for the ones in the other langues please click here: german (1). Harvested at 85 days from seed. Grown in a 57 liter (5 gallon) cloth pot with FF Ocean Forrest soil, and standard flower nutrients. Used a MarsHydro Relector96 LED light, with four 4W LED bulbs hanging on the four corners of my 2mx1mx1m tent, and added 10% UVb CFL terrarium light during flower. She was easy to grow. I believe it would be a good plant for beginners. She sprouted in four days, and grew nicely during the veg period (~30 days) with water only. Started with flower nutrients at 30 days, and continued through day 75, then flushed. No problems during the grow. Just the usual watering when she needed it, and making sure temperatures stayed in the 60's(F) during her night, and mid to upper 70's(F) when the light was on. She yielded about 70gr (2.5 oz dry weight) of very nice, tight, aromatic, & heady bud, with a mellow, sativa head buzz. Allows for clear, & functional, yet contemplative thinking. Almost no body affects. Very nice, easy to grow strain that I highly recommend. Amnesia haze is a very good strain. One of my favorites. This weed is makes you happy, and uplifted. I smoked it when i had a bad mood, and it also makes me happy, and relaxed. If you smoke too much it's more like "Psychedelic", and thought provoking, and there may be bad side effects like anxiety, and paranoia. It's strong, and has long lasting high, about 3-4 hours depends on how much you smoked. Tolerance develops slowly. The smoke is easy. Smell is like citrus, lemon, spicy haze, little bit piney. Smell isn't too strong, but if you smoke it fills the room, and your mouth. :) Taste is similar, and stay in your mouth for a long time. It's good medicine for depression, and stress. Phenotype #1, and Phenotype #2 have similar effect, but Phenotype #2 is more calming. Ruderalis genetic changes the smell, and the effect a little bit. Effect is more like "Psychedelic" even if you smoke small doses. Its smell is similar, and the effect too, then the original strain, but it doesn't give me that outstanding strong happy feeling then the Amnesia haze that i smoked in Amsterdam. Do you know something more about Royal Queens Amnesia Haze Automatic? Please help to make this database better and upload/connect your information here!